Tiverton Town have appointed former Plymouth Argyle midfielder Mark Saunders as their new manager. Saunders, 39, has been in caretaker charge at Ladysmead since last month's departure of Chris Vinnicombe. 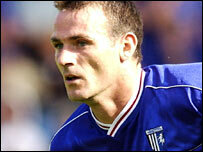 Saunders served as a player with Tiverton before moving in 1995 to Argyle, then Gillingham, for whom he made a combined 251 league appearances. Hedley Steele has been named as the club's new assistant manager, having left Bickleigh. Steele spent 12 months as manager of the South West Peninsula League Division One East side. Tiverton are currently second from bottom in the Southern Premier League, having won just twice all season.